The most popular vehicles in Vietnam for tourists are: 4 seat Toyota Vios (or Toyota Altis, Ford Lazer), 7 seat Toyota Innova (or Ford Everest), 16 seat Mercedes Sprinter (or Ford Transit), 24 seat Hyundai County, 45 seat Hyundai Aero Space.... 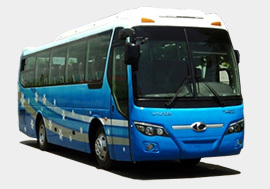 Normally, 4 seat car is good for 1 or 2 passengers, 7 seat van is for 3 to 4 passengers, 16 seat van is for 5 - 8 passengers, 29 seat Thaco Hyundai County is for 12 to 15 passengers, 39 seat Thaco Hyundai is for 20 – 35 passengers and 45 seat bus is for 20 - 30 passengers. With these arrangements, passengers are more comfortable with more space on car. 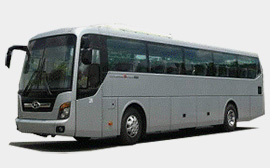 And, prices are not much different between 4 and 7 seater and 7 and 16 seater coach. Our vehicles are maintained in good condition regardless whether they are new or used. Our cars are almost under 4 years with all functions (air-con, seat belts) running well.All our drivers are well trained in driving and interpersonal skills. The driver is not only there to drive the car, but also to act as your assistant for any matter that needs attention. 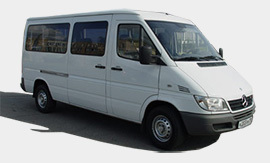 Our prices hereunder are for most popular routes from mane cities to nearby tourist attractions. You can also check with us for car rental price for any route upon your traveling plan.Our prices hereunder include: Car, driver, petrol, gas, toll fees, parking fees, car insurance, food and accommodation for driver, taxes. You can easily recognize our driver or tour guide (if required) at airport or hotel with a Greeting board with your name on it.We also offer luxury car rental service; price and availability shall be advised. Toyota Camry new models, Mercedes C classes, BMW 3 series are not difficult to find but Mercedes S classes, BMW 7 series are not so popular. Maximum number of passengers allowed in car is 2 persons. Toyota's entry level budget sedan has been given a facelift for a sharper, classier look. The hood of the Vios has been beautifully designed as a U-shape to snuggle closely, from the front hood to the front grille, and all the way down to the front bumper. The rear lights have been designed to be a convex curve, with three dimensions, simply unique. The Vios is dynamic and maneuverable, even in a narrow area, with the smallest turning radius of 4.9 meters. Maximum number of passengers allowed in car is 4 persons. The all New Innova is loaded with features and flaunts a premium style that stands out even more. Luxurious interiors ensure prestigious feel for the family while two new colors offer you a wide variety to choose from. The New Innova. Get set to drive the next stage of evolution in luxury and comfort. Maximum number of passengers allowed in car is from 6 to 9 persons. The car with luxury van safety features making your protection a priority inspired us to create segment-leading active system packages with features that use sophisticated technology to monitor the surrounding traffic as you drive. Maximum number of passengers allowed in car is 6 persons. Modern exterior is always being outstanding; New Hiace is a great combination of elegant beauty and practicality of a commercial vehicle. The modern square form in harmony with refined curved line, along with aerodynamically designed font together creates a perfect impression. 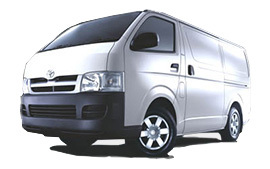 Maximum safety, commercial vehicles are driven for long hours every day, so they must have excellent safety features. Understanding this, Toyota has equipped the new Hiace with a perfect safety system. Active safety features are combined with passive ones in a balanced way to help prevent accidents as well as to minimize any possible injuries, ensuring maximum safety. Maximum number of passengers allowed in car is 15 persons. The Coach with a passion for travel, Its dimensions are small but where looks are concerned it numbers among the greats. And it offers maximum comfort for your passengers. It's the County. The smooth outer shell with its flush panoramic windows is practically easy to clean and maintain. Further, practical and functional outside mirrors ensure excellent all-round vision. In short, County is impressive in every respect. Maximum number of passengers allowed in car is 25 - 30 persons. People’s expectation toward individual mobility requires more than just a convenient means of transportation. The old understanding of cars has become outdated. A car represents individuals’ lifestyles, and it became an integral part of their lives. 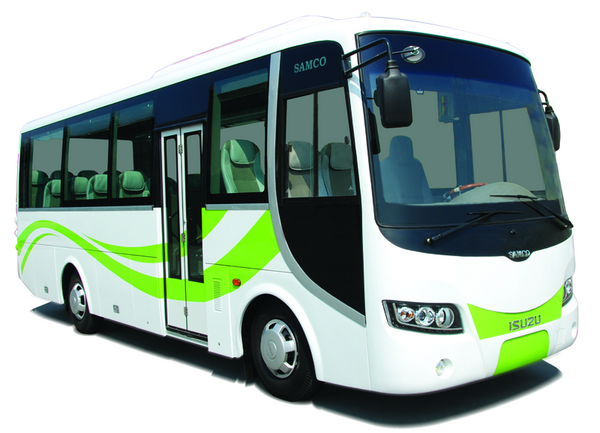 Now, there s a higher standard in mid-size bus styling and comfort: the Thaco Hyundai. Combining elegant, modern styling with a roomier, more comfortable interior and top performance, it s everything you ever wished for in a mid-size bus. And there s a wider choice of options to tailor the Thaco Hyundai to your exact specifications.